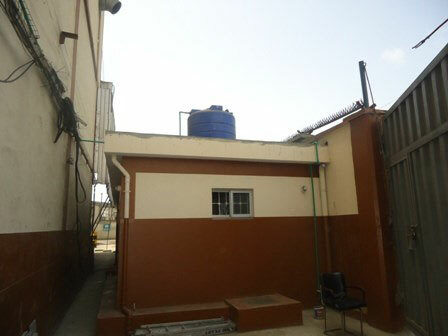 Due to additional rest rooms created for staffs of Flour Mills of Nigeria, the need to construct a septic tank to take care of the waste arose. After constructing the septic tank, waterproofing of the entire area (i.e walls and floor slab inclusive of the construction joints) became necessary so as to prevent ingress of water into the tank and also to prevent waste from contaminating the environment. Honey combs appearing on the concrete surface were treated and then coves created at the joints before overall coating was done. With move-ment under consideration, installation was done to take care of this. After overall application was done, it was left to air cure for 3 days.